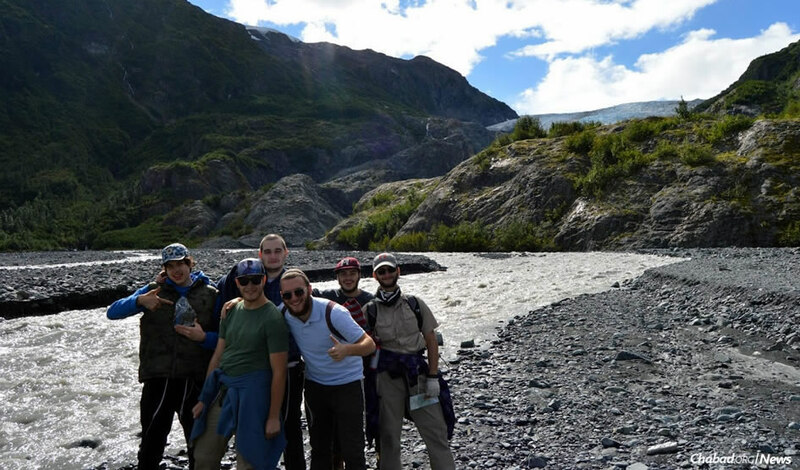 Members of the group of 21 college students who took part last summer in the Jewish Youth Adventure (JYA) trip to Alaska. The air was filled with the excited talk of exploration and the unknown as we prepared to board our flight to Alaska. The group of 21 college students gathered at Chicago’s O’Hare International Airport had a distinct mission: to embrace and explore their Jewish heritage and to satisfy a thirst for greater knowledge. Some of these young men had attended the same Jewish school as I had growing up, but said their Judaism lacked inspiration. Others had attended public school and had simply never been exposed to their Judaism. No matter their varying backgrounds, they all had joined to explore their physical and the personal worlds together. Six friends and I (young rabbinical students in training) were serving as staff members of the Jewish Youth Adventure (JYA) trip to guide these men on their physical and spiritual journey. The program was created by Rabbi Schneur Zalman Notik as part of the Jewish Youth Foundation of Lubavitch Chabad of Illinois; as director, he goes on the trips as well. The vibe on the plane was electric. Our six-and-a-half-hour flight to Anchorage gave me ample time to rally the group about the journey ahead. 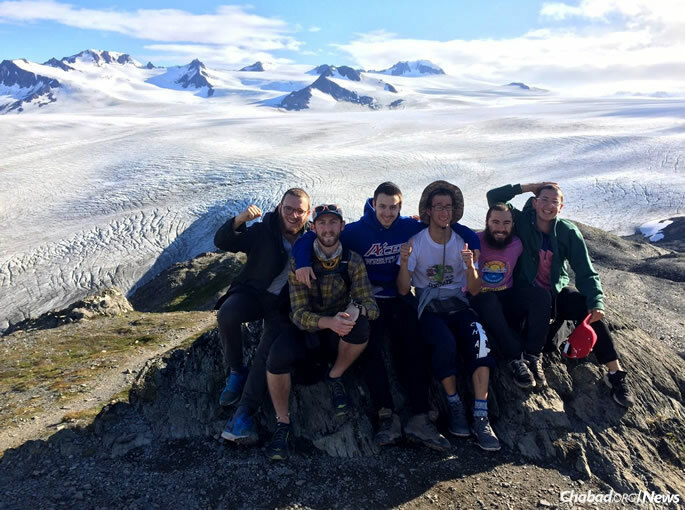 None of the trip’s 21 participants had been to Alaska before; we were setting out to traverse the unknown together. As I settled onto the plane, I glanced to my left and noticed two of our boys taking funny selfies. A few rows ahead, two JYA participants who had just met were engaged in lively conversation. From the moment the plane took off, I could feel that the journey wouldn’t be just physical; our Alaskan adventure would move us emotionally and spiritually. We touched down in Anchorage at 7 p.m. and began to race the setting sun (sunset was at 10:14) to reach our campsite in Centennial Campground, just outside of Anchorage. At night, even in the summer, temperatures can dip down into the upper 30s. Most of the men hadn’t met before the trip; tenting out in the cold was a good way to bond on a personal level. 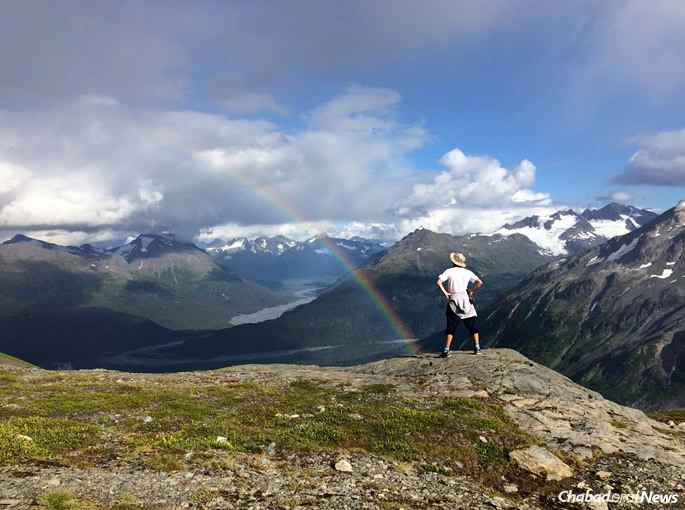 After a makeshift bonfire and kosher barbecue, accompanied by some guitar, we zipped up our tents under the great Alaskan sky and recharged for the travels to come. David Goldshmidt, left, staff member on the trip and author of the article, keeps tefillin at the ready for Jewish men he meets who want to put it on. As a staff member, my responsibility was clear: to infuse all activities with an authentic Jewish vibe. Whether it was encouraging the young men to wear a yarmulke, walking around with a pair of tefillin in case we met a Jew who hadn’t had the chance to wrap that day or just greeting everyone with a smile, I had to ensure that what I was trying to impress on others was first and foremost impressed upon myself. If the inspiration was real to me, it could become real to those around me. Every moment proved to be another story told or memory made. We hiked for hours to the peak of a mountain that overlooked endless miles of untouched glaciers; we traversed the majestic mountains of Healy via ATV; and we whitewater-rafted along a river formed by melted glaciers. We even took a ride through the forest on sleds pulled by a world-class dog-sledding team. 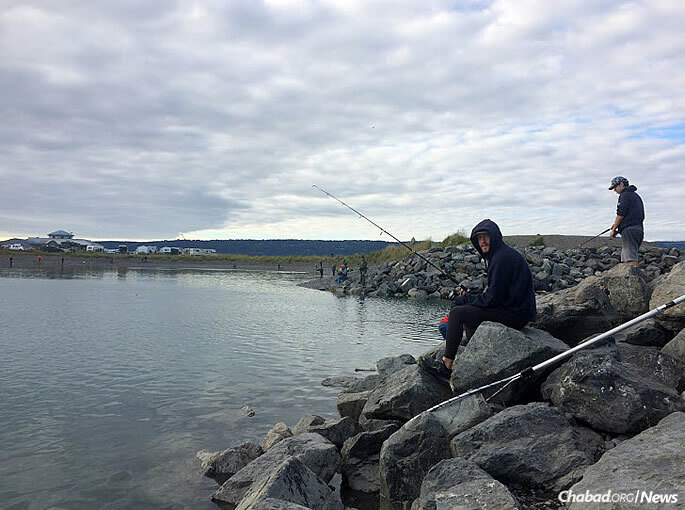 Seven days into the trip, we embarked on a fishing expedition to catch some famed Alaskan salmon. For hours, we patiently stood around the water with our fishing rods poised for a catch. After four hours, we had caught nothing. I stepped aside to help prepare dinner. The sun was setting, and I decided to go back to the water to check up on the fishers. On the way, I passed by a man and woman, and overheard them speaking in Hebrew. 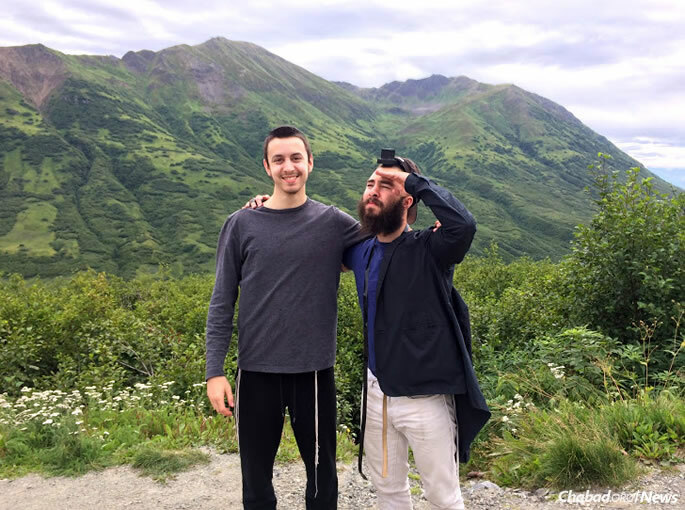 Now, we were in the Alaskan wild and hadn’t met any other Jews for days—let alone someone speaking Hebrew! I quickly piped up and said: Shalom, m’eifo atem? (“Hi, where are you from?) 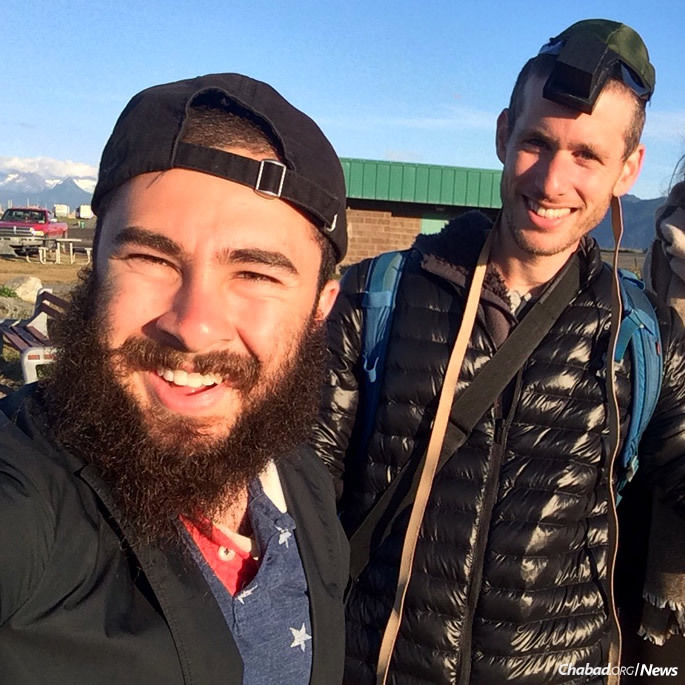 Needless to say, the couple was shocked to meet a fellow Jew out in Homer, Alaska. After a short conversation, I noticed that the sun was rapidly setting, which meant that the time for wrapping tefillin was running out. Wherever we went, we made sure to bring a pair of tefillin to be able to help a fellow Jew fulfill the special mitzvah, so I offered the man, Tomer, the option of donning tefillin. After explaining him the Divine providence of us meeting in such a far-off place, he agreed to wrap. We put on the tefillin and took a selfie. Afterwards, he thanked me wholeheartedly, saying this had been his first time wrapping since his bar mitzvah. The whole failed salmon-fishing trip was worth it just to inspire a Jew 6,000 miles away from home to put on tefillin for the first time in 20 years. No matter the backgrounds of the Jewish participants, they all had joined to explore their physical and their personal worlds together. Friday night kicked off with such energetic prayers that I felt like I was at the Western Wall in Jerusalem. After much singing and dancing, we enjoyed a royal Shabbat meal (after a week of barbecues, this was much appreciated) together with 100 community members and international tourists. Every trip participant decided to stay after the meal to sing and dance even more. On Shabbat day, a couple of the young men were called up to the Torah for the first time—an impromptu bar mitzvah celebration. After our midday meal came a farbrengen (a Chassidic gathering imbued with song, food, stories, inspiration, encouragement and positive resolutions) with Rabbi Greenberg. He asked each participant: “What does Judaism mean to you?” Our diverse crew produced such genuine and inspiring answers, some of which I’ll never forget. Each young man on his own accord then resolved to make a small increase in his Jewish observance and spread the light of Judaism to his surroundings. One even committed to starting a Jewish club at his school. After farbrenging with the rabbi for more than five hours, we looked at the clock. The sun sets late in Alaska in the summer; Shabbat ended at 11:18 p.m. We concluded it with a musical Havdalah. The excitement of the guys who had just kept an entire Shabbat either for the first time ever or the first time in a while was really something special. Fishing for famed Alaska salmon. On one of the final nights of our trip, we assembled a bonfire. Fellow staff member Moishe took out his guitar and began to play soul-stirring Chassidic melodies by the fire. We were all exhausted after such a long day, but the fire’s warmth and musical inspiration kept us awake and close together. After spending more than a full week together, we had developed deep relationships and held meaningful conversations. The discussion that evening led to personal matters; some in the group said they felt that we, as rabbinical students, were unable to truly relate to the struggles they faced in connecting to their Judaism in a meaningful way. The goal was to learn and bond, and enjoy the great outdoors. It was at that moment that I realized my unique role on this trip. A few years earlier, I had been in the same situation as these young men. I grew up aware of my Jewish heritage, but found it dry and uninspiring. Like these young explorers, I had asked myself: “What does Judaism mean to me? What is my purpose here?” I decided that it was time to share my own journey. I traversed high school as a typical teenager, my life filled with unanswered questions. That all changed when I embarked on the teen program of JYA. 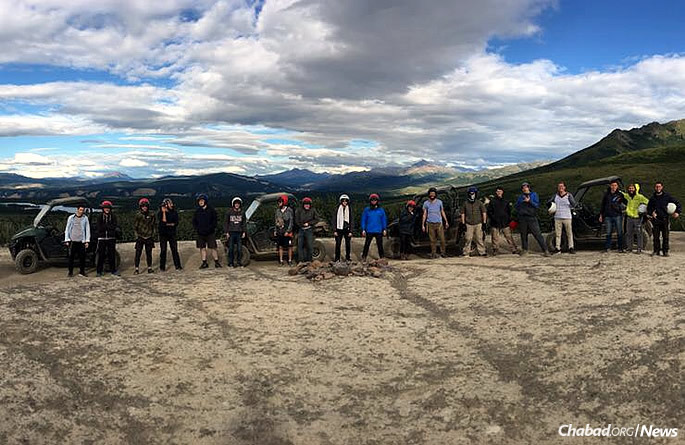 Making its way from Denver to Los Angeles, the camp was a custom-tailored road trip for high school boys to have an adventurous time in a Jewish environment. The other boys hailed from all over the United States, and I hit it off with them immediately. I may have not have had much in common with them in terms of social or religious background, but out West, it didn’t matter. When you’re rushing down a river into level-five rapids, sleeping in a tent out in bear country and starting a fire at night to keep warm, you care less about the shoes your comrade is wearing and more about the content of his character. We didn’t know much about Judaism, but as the Lubavitcher Rebbe taught: “He who knows aleph should teach aleph.” And so we encouraged each other to grow in our own way, one small step at a time. The friendships I forged were injected with true brotherly love, as the Torah prescribes, and until today these remain my deepest relationships. But what really changed my life was its staff. Prayers and Torah study are integral aspects of the trip. Rabbi Yosef Greenberg, director of the Chabad Jewish Center of Alaska, reads as a JYA participant is called to the Torah during a Monday-morning service. My 21-year-old rabbinical-student counselors were seemingly from another dimension. They were cool, happy, outgoing, caring, and most importantly, they were real. These young men resuscitated the unconscious Judaism I had experienced until now. They embodied true Judaism—caring about my essence as a person. I was a gem, a precious soul enclothed in a body. The idea was to witness something new, even something extraordinary. We grabbed the tefillin from our tent and returned to her trailer to meet her 66-year-old husband, Jason. Raised in rural Colorado, he knew nothing about his heritage; all he knew was that he’s a Jew. After explaining the mitzvah of tefillin, he agreed to put it on. At six in the morning in the Idaho countryside, Jason officially celebrated becoming a bar mitzvah. We broke out into such joyous dancing. I noticed a tear slide down his cheek. It was at this moment that I began to feel how real Judaism was, how alive. This is what I had been searching for all along. My counselors (who by now seemed like older brothers) kept in touch with me throughout the year, calling on my birthday and other occasions. I turned to them for inspiration and guidance. After that summer, I returned to Chicago with a whole new spirit. I was completely uplifted. I had finally discovered my niche and come home a happy, confident and inspired young man. Relationships with my family and my community blossomed. I had a clearer sense of direction, combined with a mission and purpose: to love every Jew unequivocally and to illuminate my surroundings with the light of Judaism. 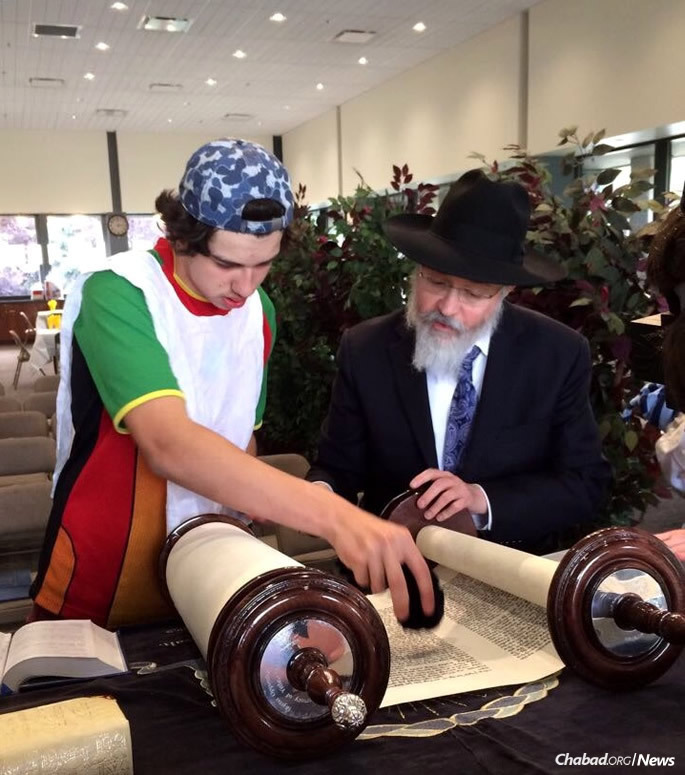 I slowly began to learn more Torah and more about my Judaism, and began to take active roles in the community—volunteering to help the elderly and those with special needs, leading services at my synagogue, even becoming president of my local Jewish teen club. Many fellow JYA members lived near me in Chicago, and together, we kept the camp spirit alive throughout the year. Camp was our spiritual refueling to make it through the year until the next trip. When I graduated high school, I realized that this was my chance to solidify my commitment to my heritage, and essentially, to myself. I decided to attend yeshivah in Israel to embrace my Judaism full-time. After toiling for three years, I took my commitment to the next level, assigned to spend the year in Johannesburg to volunteer at Torah Academy Boys High School and assist the greater Johannesburg Jewish community. I finished telling my story. I looked at the souls circling the bonfire. They no longer viewed their hopes to grow in their Judaism as an unlikely ideal fueled by fleeting inspiration, but a clear goal that with enough effort and determination could be totally attained. After all, here I was, sitting before them—living proof that an “average guy” could accomplish something extraordinary. After spending a week together, the group developed deep relationships based on shared experiences and meaningful conversations. In the months that followed, I considered the impact on each person who had come on the trip. Walking off the plane were no longer overwhelmed, confused and lost young men. One had learned how to wrap tefillin, and started going to class with a pair in hand, eagerly looking for a fellow Jew to connect with; one wound up studying at Bar-Ilan University in Israel, and became more eager to attend a Shabbat dinner and even invite a friend or two; another two were meeting regularly to keep their Jewish spirit alive while living in an exurb of Chicago, with no other Jewish friends or neighbors. As the Lubavitcher Rebbe—whose inspiration and guidance was the driving force behind the trip—would emphasize: the power of one small mitzvah is infinite. Words from the heart penetrate the heart. Anything pursued with love and friendship will ultimately succeed. David Goldshmidt, 21, of Chicago, served as a mentor on the trip after having completed his yeshivah studies in Brooklyn, N.Y. Rabbi Schneur Zalman Notik is the founder of Jewish Youth Adventure and Traveling Jewish Teens, part of the Jewish Youth Foundation at Lubavitch Chabad of Illinois. Click here for information about JYAdventure, this year from July 23 to Aug. 2.